There is an almost hidden section of Green Hill Cemetery in Greensboro, NC enclosed within the walls of a high brick wall. Walking through the black iron gate you immediately notice the difference between this area and the rest of the graveyard. 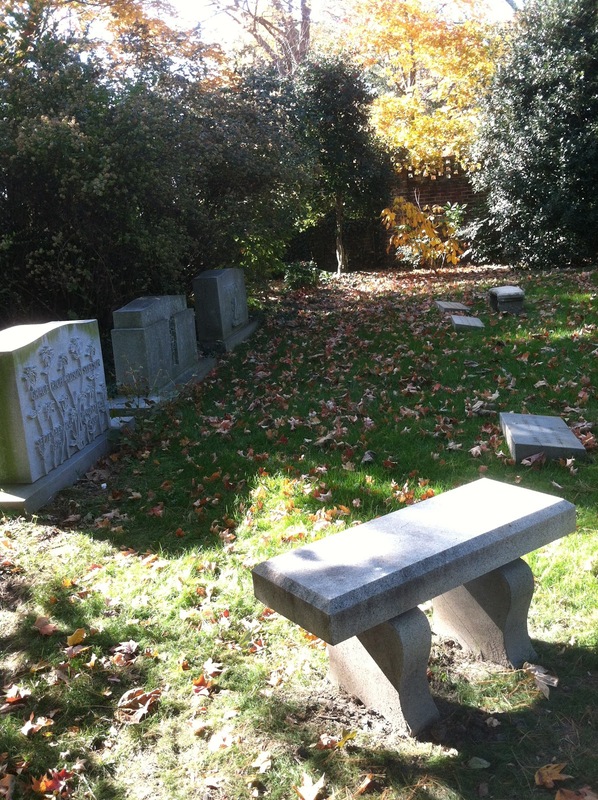 There are carefully planted trees and shrubs, giving the space more of a “backyard” feeling, despite the presence of the headstones and ledger markers. There are also benches and stone plaques that sit flush to the ground containing phrases and verses but aren’t an individual’s headstone or footstone. Among the surnames in this plot are Richardson, King, Carlson, Murmey, Prickett, and Stetson. This intricately carved headstone belongs to Grace Richardson Stetson, who lived to the age of 91. I thought this grave marker was particularly beautiful because of the floral motif which seems to intertwine with the letters and numerals of her name and dates of birth and death, continuing to grow and blossom beyond her name. This could be a metaphor for a legacy that continues to bloom beyond the confines of the person’s mortal life. Or perhaps someone selected it because it made for a lovely marker. According to Grace’s obituary, she passed away in her Wilder, Vermont home. She was the granddaughter of Lunsford Richardson, pharmacist and the inventor of Vicks VapoRub. Throughout her childhood and early years, Grace and her parents lived in Greensboro, London, New York, and Connecticut. In 1935 she married Eugene William Stetson Jr. in Connecticut, where the couple went on to have four children. Stetson was a member of the Skull and Bones Society and his obituary discusses his career as an investment banker. Grace’s father-in-law, Gene Stetson, had established himself as a key player in the business world through his dealings with Coca-Cola and other investments. After divorcing Eugene, she married Paul Lambert in 1957 and spent the remainder of her life in Vermont. The obituary also speaks of Grace’s charitable nature, volunteering with the homeless and conducting art classes in jail as well as raising substantial amounts of money for Cystic Fibrosis. The last cause was close to her heart, as one of her grandchildren had Cystic Fibrosis. Unfortunately, this particular grandson, Elisha Tripp, passed away in 2011. 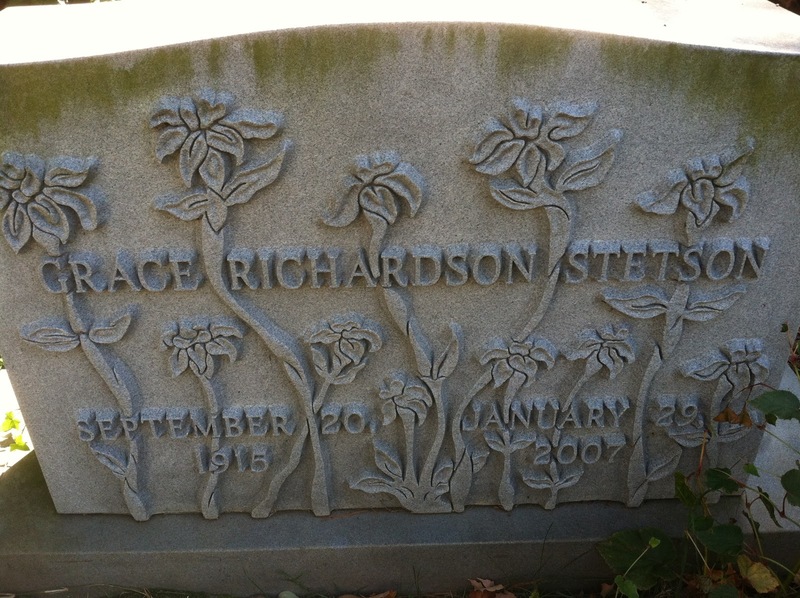 I’m not sure why her grave marker/surname is “Stetson” when her last husband was a Lambert. I was unable to find any additional information on Paul J. Lambert and he isn’t mentioned as a survivor or as Grace being predeceased by him. Perhaps they divorced as well. In Greensboro’s burial index her surname is listed as Stetson and her funeral was authorized by E. William Stetson, one of her sons. What a lovely marker. I really like the design with the flowers looking like they are growing out of the earth. The name is a mystery – maybe she kept the name Stetson as a 'professional' name since there might have been some cachet to having a name like Stetson, whereas Lambert was a 'nobody'. Previous Previous post: A Cautionary Tale About The Effects of Whiskey on a "Good and Popular Citizen"